DensElement® Barrier System works under most cladding types including brick, metal panels, rain screen, inverted walls, EIFS, stone, and fiber cement siding. And, it is NFPA 285 compliant when used in code-evaluated EIFS systems. 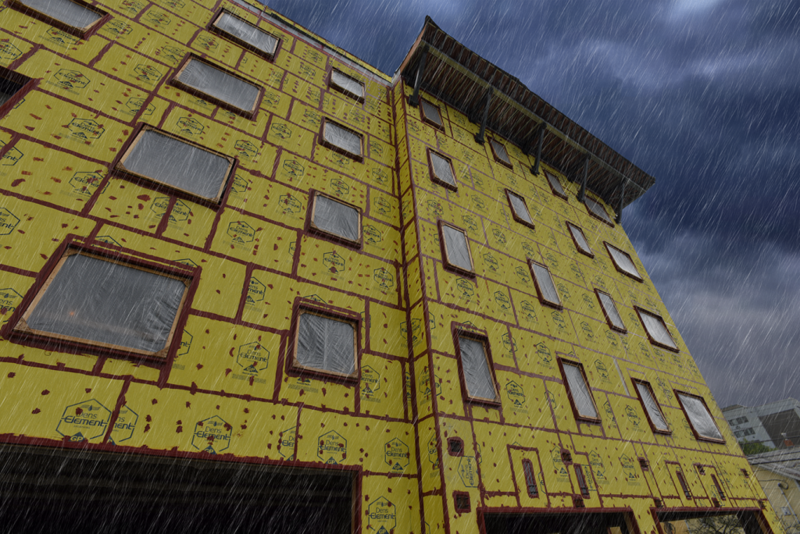 Simplified installation, optimal protection against bulk water infiltration, and the versatility to work with a wide range of cladding options makes DensElement® Barrier System a clear choice for protecting your design. You are depended on to choose innovative products with high performance as well as productivity benefits. With DensElement® Barrier System you can deliver both. Installation crews don’t have to install a separate WRB-AB to achieve a continuous barrier. This simplicity of installation can eliminate one or two passes around the building, requires less labor, plus any sheathing installer or waterproofing contractor can install it – opening up a wider pool of laborers for your projects. The result? Dry-in buildings faster. "Cladding fastener 'seal ability' was a big reason for choosing DensElement® Barrier System. We will definitely specify it on future commercial projects."